We enable our customers to focus on their core business functions by taking the worry out of owning a computer network. With over 200 clients and 20 years under our belt, we know what works in theory and what works in practice. Our industry-leading awards and certifications prove we are up to date with the latest innovations. Our award winning BA365 service combines Office 365 with the services you need to start and the support you need to keep your IT running at its best. We configure your Office 365 environment, migrate your data, coach you and your staff and maintain your PCs. We enable you to focus on your core business functions by taking the worry out of owning a computer network. Kinetics KARE has a range of plans designed to put you in control of your IT. No matter what your budget, we’ve got an option for you to enjoy worry-free IT. Your teams, at your place, our coaching maximises user computer productivity by working at user's own desks, so they learn while working. No travel time lost, we come to you to train in software like Word, Excel, SharePoint, Lync and PowerPoint... among many others. 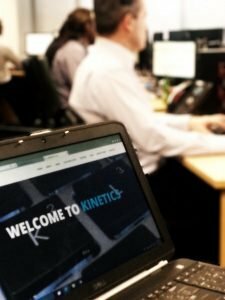 Kinetics is an award winning IT support and solutions company, with a range of options to meet your requirements for value and confidence. Microsoft NZ's 2017 Country Partner and Cloud Productivity Partner of the year, and 2013 global winner of Microsofts' Small Business Partner of the Year. We have more Microsoft certifications than any other IT company supporting medium sized business. Managed by the owner and founder, Andrew Hunt, with a long serving highly experienced management team. Since 1996 we have evolved, grown and matured with the IT industry to help our clients stay ahead. We have the capacity and expertise to support your business IT requirements. Find out how we might solve your business needs by getting in touch.